Yesterday I asked one of my forecasters if they were especially busy out on the floor given Sandy’s progress through the Northeast. He began to say yes, but then paused, laughed, and said instead, “Not really. I mean, there’s nobody flying out there right now.” His statement was quite true, as yesterday at 4 pm, the number of cancelled flights had grown to more than 19,500, with more expected as the NY area airports are still expecting limited operations. LGA in particular will remain closed until further notice due to flooding and damage on the tarmac and runways. 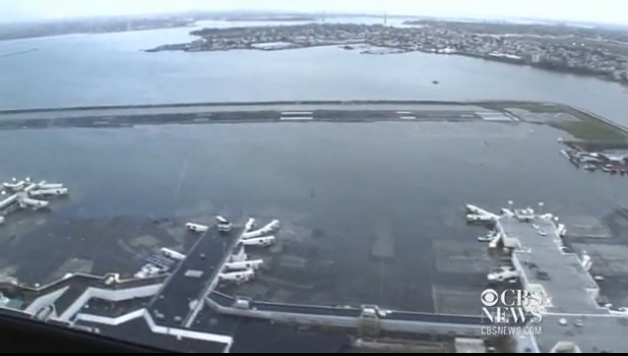 The photo below (courtesy of CBS News) captured the standing water at the airport yesterday afternoon. As the afternoon was oddly quiet here yesterday, I took the chance to view Sandy through some of the GOES-R products at my disposal. Below is a loop of ACHA Cloud Top Heights from 121029 1745 UTC – 121030 0755 UTC (click for animation), in which the transition of Sandy from tropical to post-tropical can easily be seen. Tropical characteristics, a more banded appearance shown by the higher cloud tops (blue shades) wrapped around the eye of the storm, slowly transitioned into the more comma-like shape of a post-tropical system and more uniform cloud top heights (green shades) as the dry stratospheric air was wrapped in. With all the excitement over Sandy ramping up, the National Airspace System on the East Coast has become oddly quiet. With this large storm slowly making landfall, air traffic within the New England area is eerily quiet, with all three NY area airports (LGA, JFK, and EWR), as well as DCA, BWI, and PHL grounding in and outbound air traffic until at least early Tuesday. BOS may join this list later today, and other airports further from the storm, such as ATL, have already implemented ground delay programs as well. Shown in the graphics below are loops of visible satellite imagery overlaid with ASDI flight routes yesterday morning when operations were still running normally overall (top) compared with flight routes this morning (bottom). Note the significant amount of empty airspace within the Golden Triangle, an area in which air traffic is typically the busiest in the country. Thus far, the current number is upwards of 13,500 flights cancelled, the majority of which are due to Sandy. Estimating 100 people per plane, that is 1,350,000 passengers affected! This eerie absence of flights in the Northeast is being felt throughout the entire nation, and even worldwide as a number of international flights are stranded abroad. It is a ripple effect caused by displacement of both planes and crews at various airports. For example, a flight from JFK to ORD may then go on to LAX, so if it is stranded in JFK, the LAX flight will be subsequently affected. Additionally, if the flight crew are also stranded, those flights they were meant to move on to once in ORD will then be short personnel, causing further delays as replacements are required. While ground stops are scheduled to be lifted early Tuesday, it will take quite some time before airspace operations have completely returned to normal. In an effort to avoid as much displacement as possible, a number of airports in the Northeast got as many airplanes out of the area as possible before the storm hit. However, even with these preparations, this will not come cheap to the airlines as they have been waiving fees and refunding tickets for those cancelled flights and are also responsible for putting stranded flight crews up in hotels until the storm passes. Delta Airlines, in particular, has hubs in LGA, JFK, and ATL, with many flights also in and out of DCA and BOS. Here at the AWC (under gorgeous, sunny skies I might add), the extent of this very large storm is easily seen through our satellite imagery. The focus now has shifted to providing accurate forecasts for the next few days so that aviation operations can slowly return to normal. As we are in full preparation mode in the DC/Baltimore area, I thought I would share a couple very interesting VIIRS images with you, courtesy of CIMSS at the University of Wisconsin-Madison and NASA SPoRT, through a joint project with JPSS. Sandy’s track forecast hasn’t changed much and I think I’ve covered the threats in the last few posts. Now let’s focus on where we are as of the last 24 hours. The Suomi NPP VIIRS RGB Air Mass image using Google Earth valid yesterday, 10/27/12. Image courtesy of NASA SPoRT. 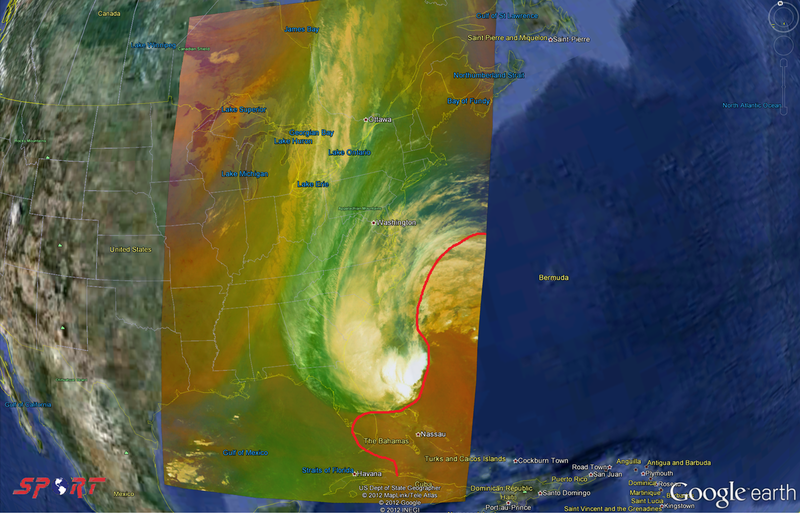 The VIIRS RGB Air Mass image above from yesterday shows the very high resolution of the VIIRS instrument when analyzing a complex storm such as Sandy. Everything to the right of the red line is very dry air at high altitude that is cutting into Sandy’s tropical environment. What is the source region for this dry air? Believe it or not, it is most likely due to stratospheric dry air from an old upper low in the Western Caribbean that got tangled up with Sandy. The dry air is introduced through something called a tropopause fold. All this means is that this feature introduces a non-tropical air mass into a tropical air mass, hence the hybrid, half-storm look on satellite. 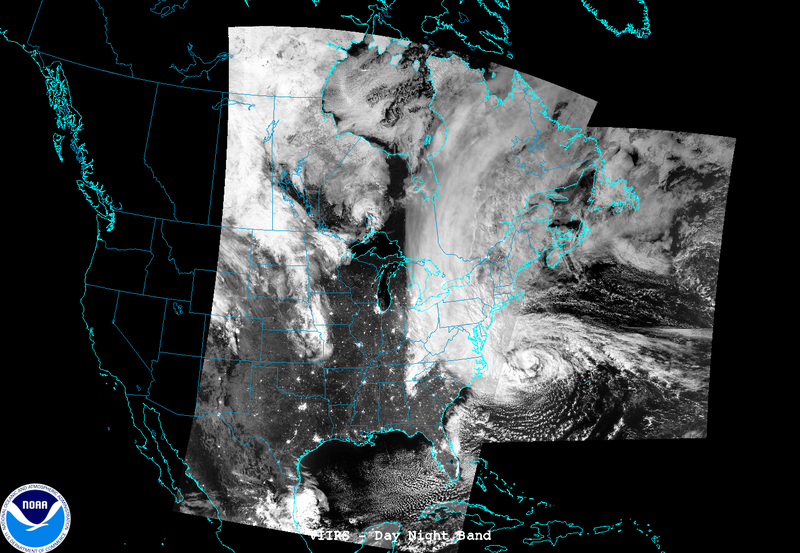 Suomi NPP VIIRS Day-Night band image from 0625z on 10/28/12. Image courtesy of CIMSS/SSEC/University of Wisconsin-Madison and NOAA/NASA/JPSS Project. 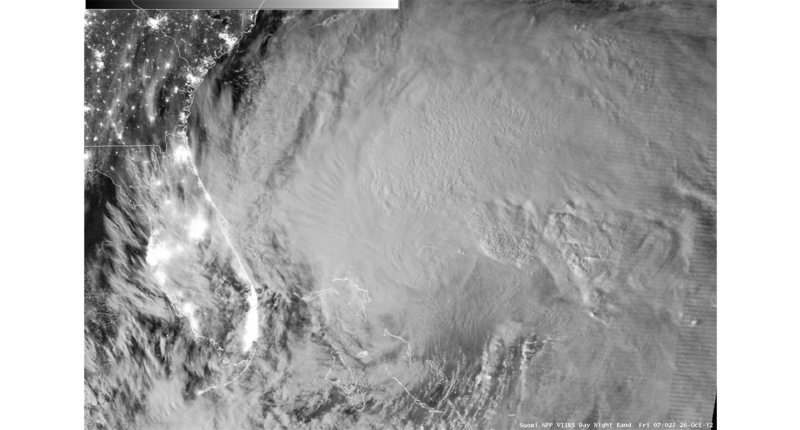 Much like yesterday morning, the image above is the day-night band on the Suomi NPP VIIRS instrument. Again, this is the middle of the night and the “day-time like” image is courtesy of our full moon. See the city lights along the East Coast? Absolutely amazing what this satellite can provide to forecasters! A special thank you again to Liam Gumley of CIMSS/SSEC/University of Wisconsin-Madison for working on this in early morning hours this morning! 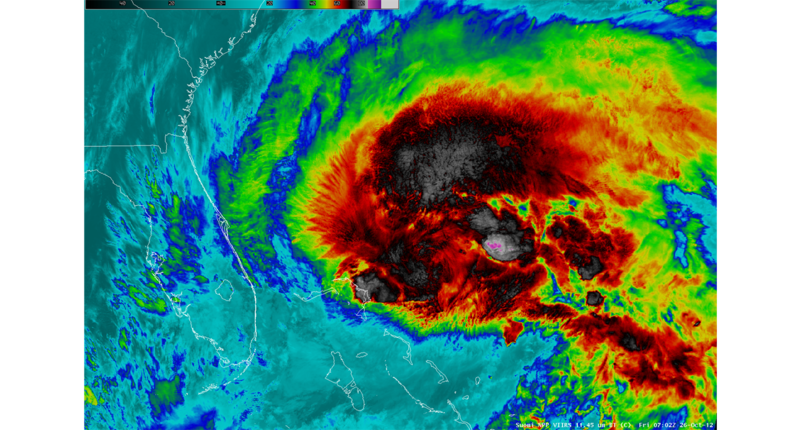 Suomi NPP VIIRS day-night band and infrared imagey with surface pressures and buoy observations overlaid. Image courtesy of the CIMSS/SSEC/University of Wisconsin-Madison satellite blog. The final image today shows a close-up view of the day-night band and infrared image (click on image for short animation) with surface pressures and buoy observations overlaid. 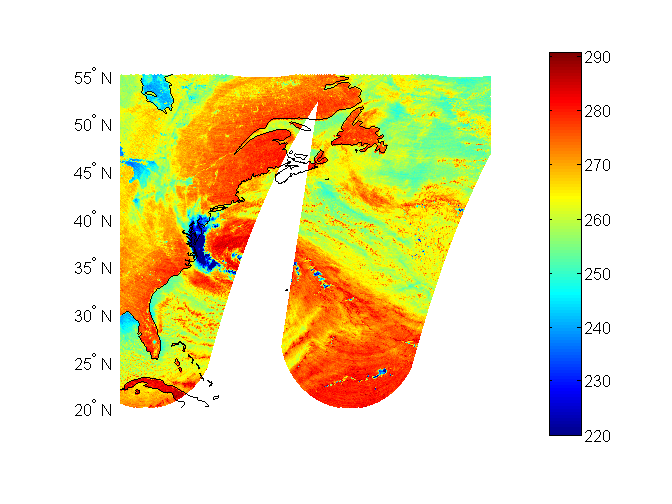 The details provided by these two bands will be able to assist forecasters in detecting minute storm-structure and environmental changes, even though it comes from a polar orbiting satellite. We don’t get many passes over the U.S. by this satellite per day, but an image like this could be critical in helping the forecaster detect these changes. 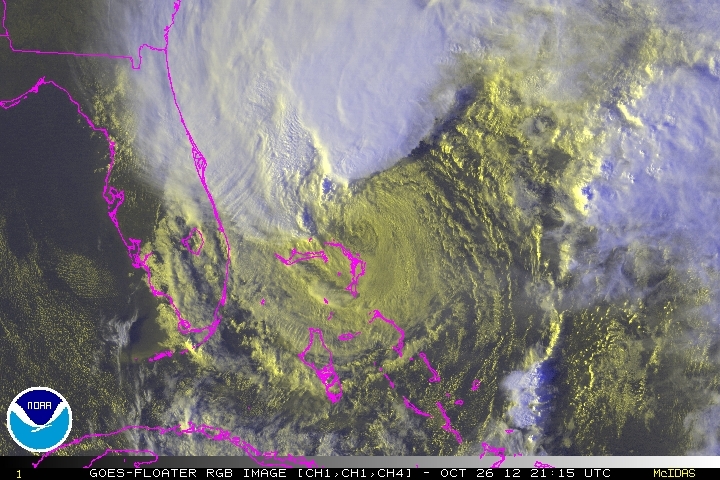 I will try to post again later today with a more detailed breakdown of the large scale environment affecting Sandy. Thanks for reading! While I plan on writing a more general update later today, I thought you would find the image below interesting. This is a “visible” satellite image at night courtesy of the Day-Night Band on the Visible Infrared Imaging Radiometer Suite (VIIRS) located on the Suomi National Polar-orbiting Partnership (NPP) satellite. Suomi NPP is a new NASA/NOAA polar orbiting satellite for improving weather forecasting and is part of the Joint Polar Satellite System (JPSS). The Day-Night Band is one of many capabilities that NPP will provide over the next few years! 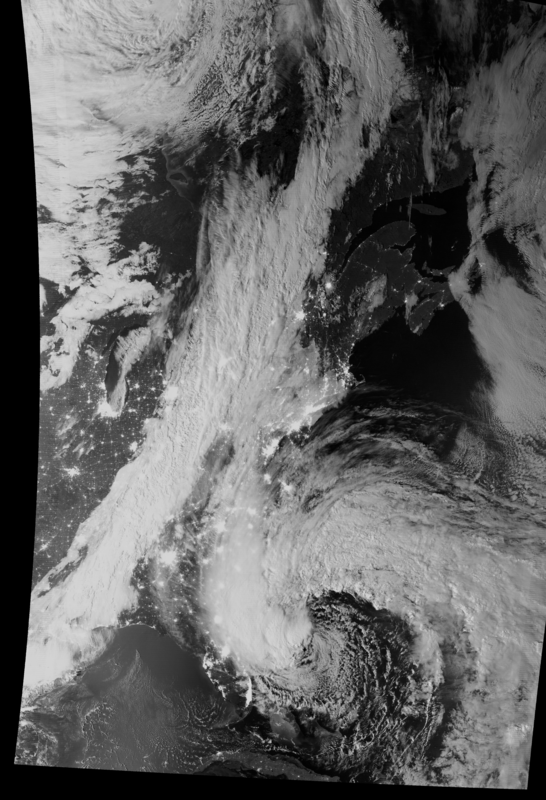 In the image, you will notice the city lights along the East Coast as Sandy lurks offshore. The details offered by an overnight satellite image allow forecasters to monitor slight nuances in convective development and this is achieved by using the sun’s reflected light on the moon which is at 93% tonight. A special thank you to Liam Gumley from CIMSS/SSEC-University of Wisconsin-Madison for producing this image for us in the early hours this morning! 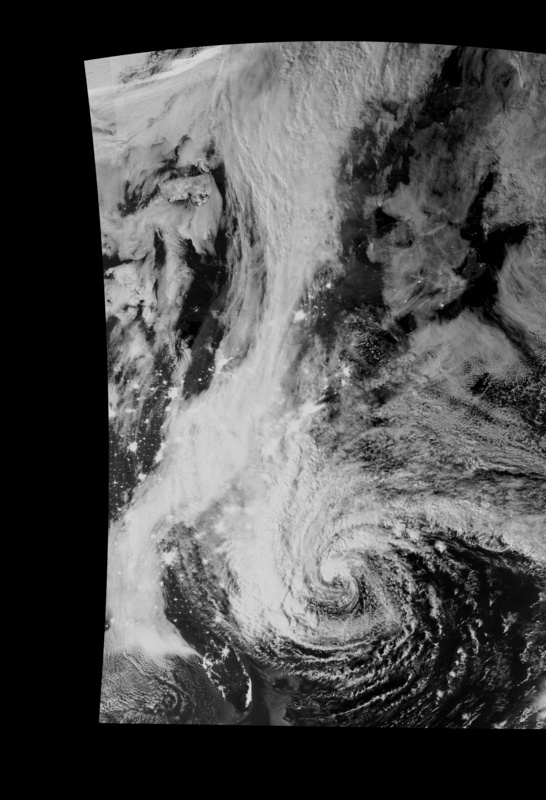 The Day-Night Band on the VIIRS instrument aboard the Suomi NPP satellite.